LolÃ« is a popular activewear label based in Montreal, Canada. It specializes in technically advanced, ultra-stylish sportswear that helps women to get active, including this eye-catching range of LolÃ« pants. 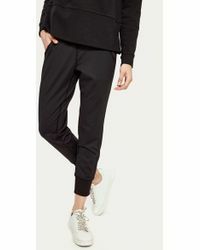 Here you'll find a broad range of joggers, cargo pants, leggings and capris pants that are ideal for all pursuits, with lightweight, comfortable and quick-drying fabrics to maximize your performance. From the gym to the streets and everywhere in between, elevate your daily ensembles with LolÃ« pants.